The Council of Korean Religious Leaders, the dialogue channel for the leaders of seven major religions in Korea, visited India and Nepal from March 5~13 to pay homage to four key Buddhist holy sites where the Shakyamuni Buddha was born, attained enlightenment, delivered his first sermon and entered into parinirvana. The pilgrimage started in Lumbini, Nepal on March 8, and the leaders also discussed with the local authorities about providing medical aids to the residents of Lumbini. The visit was planned as part of the Council’s program of visiting and experiencing the holy sites of other religions. Venerable Metteyya Sakyaputta, the Vice Chairman of Lumbini Development Trust, a government organization under the Ministry of Culture and Tourism explained upon meeting the seven religious leaders of the Council, “Lumbini’s population exceeds 1.6 million, but there are hardly any medical facilities, causing great difficulties.” As such the religious leaders pledged assistance either by supporting the establishment of medical facilities or provide training to the Nepalese candidates to be medical professionals. Most Venerable Wonhang, the president of the Jogye Order of Korean Buddhism expressed his opinion saying that “It would be most desirable if Korea’s religious communities can work together to set up establishments that can provide medical services to the local population, and at the same time train the local candidates to be medical professionals.” The patriarch of Won Buddhism informed the other leaders that Wongwang University Medical School has been sending a team of doctors and nurses twice a year to Lumbini to help the local people. He was of the opinion that providing medical training to the promising Nepalese youth would be the most fundamental solution to the problem, to which the Catholic leader of the team agreed, adding that the members of the local medical community, once properly trained in Korea, can return to Nepal and be supported to set up hospitals and clinics. 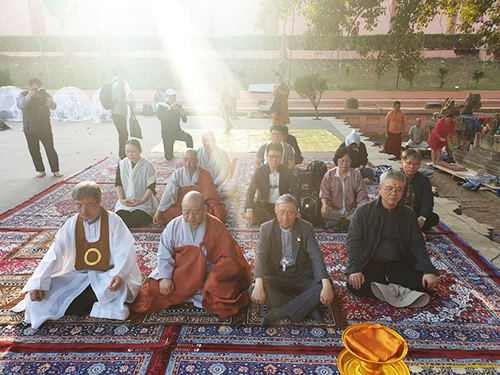 The leaders from the seven major religions in Korea agreed that as soon as they returned to Korea, they would start discussing concrete measures with their working teams on how to work together to provide medical aids to Lumbini. They also decided to invite and include the officials of the Ministry of Culture, Sports and Tourism and the Ministry of Health and Welfare in the discussion as well.